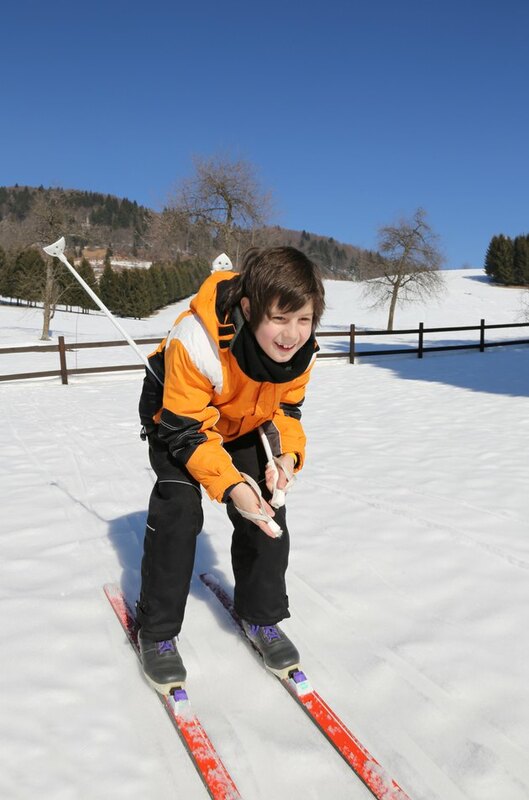 Cross-country skiing provides you and your kids with an effective, low-impact, aerobic and calorie burning workout. To make your family ski outing as fun as possible, you need to make sure your children have the proper equipment, in the right size. Buying or renting skis that are too long or too short for your children will make it hard to them to ski across the snow and have a good time. Measure your child's height with a tape measure. Convert the measurement from inches to centimeters by multiplying the number of inches by 2.54. Add 10 to 30 cm to your child's height to determine her proper ski length for a set of classic style skis. Add 3 to 4 cm to your child's height if you are fitting her for skating-style skis. Hold the ski next to your child and have her stick her arm straight overhead. A correctly sized classic-style ski will be just below the wrist of the arm extended overhead. Skating skis extended only 3 to 4 cm over your child's head. You use classic cross-country skis on groomed trails with grooved tracks made in the snow. This is the simplest cross-country skiing style and best for children as they learn. With skating skis you ski with a motion where you push your feet out to the sides; similar to inline skating or ice skating. For children ages 3 to 5, classic style skis should only be as tall as they are and not 10 to 30 cm taller. To get the best fit possible go to a knowledgeable ski shop that performs a detailed and comprehensive fitting. Correctly sized skis will not work effectively without all of the other equipment also fitting properly. Make sure you get the right size boots, pools and bindings your children can use easily. Not taking the necessary time to outfit your children appropriately can lead to a negative experience for you and your children.